Choosing to live a clean, natural, organic, unprocessed life style, doesn’t mean boring or tasteless food. It doesn’t mean you have to deprive yourself and eat only salad, carrots and celery all day. 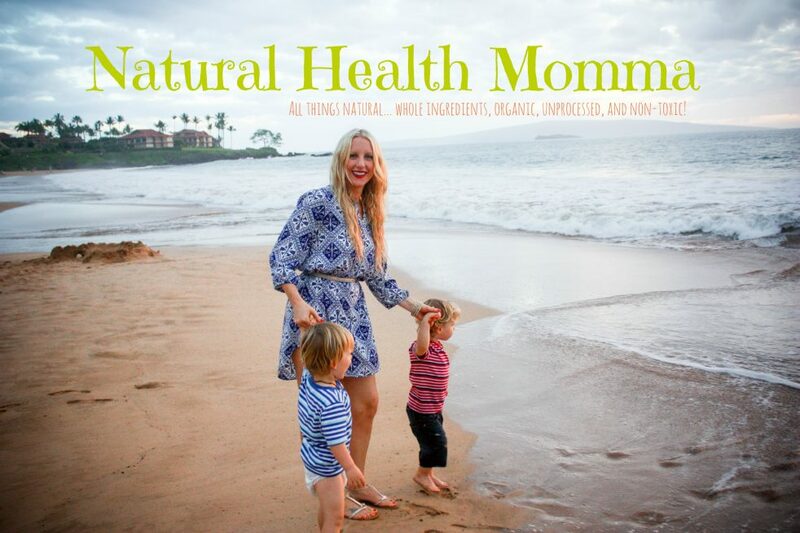 Eating a natural diet is an adventurous way of eating, and is much more satisfying. A naturally made dessert can also be part of a healthy diet! It’s okay to enjoy something sweet… and NOT feel bad about it! If you are just starting out on your path to eating a natural diet full of clean foods, this recipe may or may not be for you! Sometimes, when we make changes in our lives, we need to get rid of all that was “bad” before bringing balance back in. When making a decision to eat clean you will need to get rid of all the sweets to help your bodies detox from a sugar addiction. Because mostly all processed foods have some type of processed sugar added or worse, high fructose corn syrup, our bodies become literally ADDICTED to sugar! Your body will crave the sugar, just like a smoker craves a cigarette. You will need to make the call on where you are at in your health journey. However, I’m definitely not into depriving myself, and neither should you! Enjoying a naturally made dessert once a week is just fine! I can easily eat one or two of these little guys and be very satisfied! 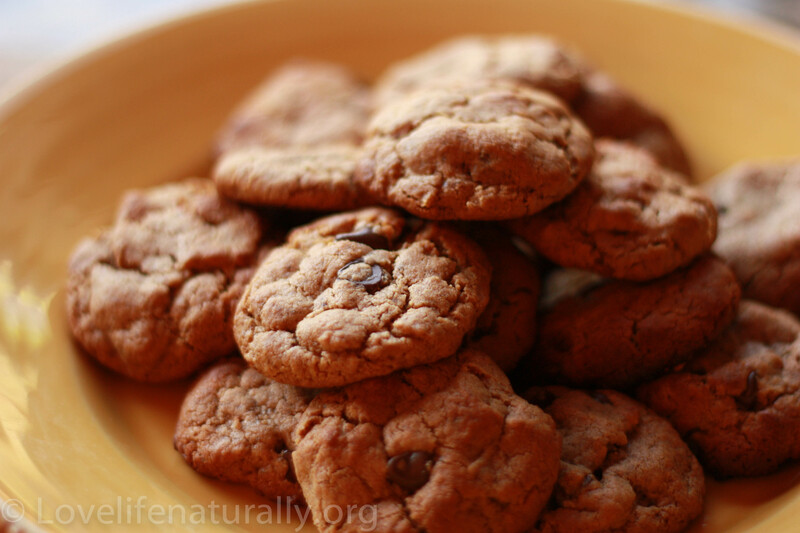 These are natural, and ‘real food’ gluten-free chocolate chip cookies! Mix together the first five ingredients. Once they are combined, fold in the chocolate chips. Scoop out and roll into 24 balls. Place on a parchment paper lined baking sheet and back for 10-12 minutes. They should be lightly golden on top when done. Serve with homemade Raw Almond milk or milk of choice! I love feedback! Let me know what you think of my favorite raw almond butter chocolate chip cookies! Enjoy! Okay, I know you are more the expert in this area than I am. I’m just learning, literally – I just cleaned out my fridge and pantry – Changes are a coming and my poor husband doesn’t even know it! HA! they are butter-free, gluten-free, and can be made vegan by excluding the egg whites and using dairy-free chocolate chips such as Ghiradelli or Guittard. Place chickpeas, vanilla, and coconut milk in a small food processor; pulse until mixture forms a smooth paste. Pour chickpea batter into a medium bowl. Add honey, almond butter, egg whites, salt, and baking powder to the chickpea batter; mix until thoroughly incorporated. Without cleaning out the food processor, add the oats and grind to a flour-like consistency. Stir oats and chocolate chips into batter. Drop cookies by the tablespoon onto a sheet pan. Gently flatten and shape cookies with back of a spoon or your fingers. Bake for 15 minutes at 300ºF, turning halfway after 10 minutes. Cookies will remain soft and will not spread. Wow! Thanks for sharing!!! What a recipe! I love that you are sharing and making such a life change nutritionally… for you and your hubby 😉 What a blessing you are for your family! LOVE IT! I was hoping you’d do a desert recipe AND I had just come home with a new jar of almond butter when I saw this post- what perfect timing you have 😉 Seriously can’t wait to make these! My stomach is growling now. WOW!!! Where have these cookies been all my life??? I just made a batch and they are AMAZING!!! It’s going to take all my willpower to not eat them all in 1 sitting!!!! Thank you so much for this recipe!